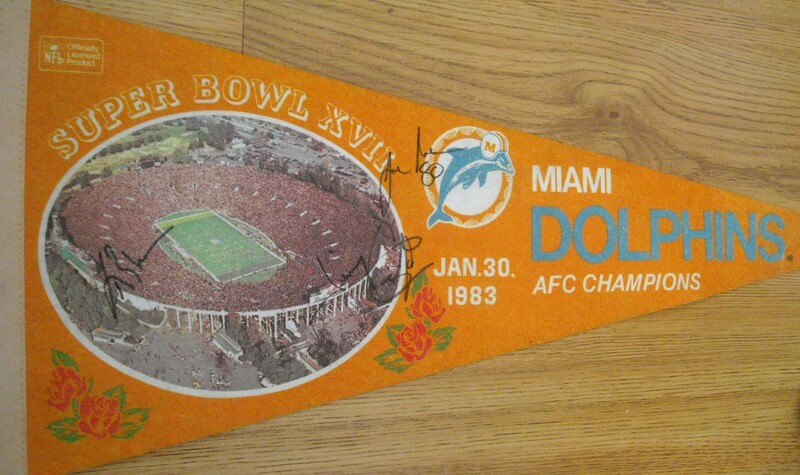 Original Miami Dolphins AFC Champions Super Bowl 17 felt pennant autographed in black marker by three of the team's key players: linebacker Kim Bokamper, wide receiver Jimmy Cefalo and tight end Joe Rose. Cefalo caught a 76 yard touchdown pass in this game but the Dolphins still lost to the Redskins 27-17. Has very minor flaws but in excellent condition for its age. With certificate of authenticity from AutographsForSale.com. ONLY ONE AVAILABLE FOR SALE.